If you are looking for go karting in Swindon or near the M4 corridor then Swindon Karting is the ideal choice. There is a sensible range of events to choose from with race formats ranging from sprint events for small groups right up to exclusive Grands Prix or team endurance races for larger corporate groups. Stag and hen parties are of course very welcome and many weekends are full of these sorts of groups. Leave M4 at Junction 15 and take A346 south towards Marlborough. Continue up hill and turn right alongside the garage, signposted “Barbury Castle” and “Chiseldon”. Follow B4005 through village of Chiseldon and on to the T-junction. Turn left signposted “Barbury Castle and "Alexandra Conference Centre" and follow conference centre signs then turn right. Drive past the conference centre to T-junction, where you will see the Actiondrome and Swindon Karting in the hangar in front of you. More racing time than the standard grand prix for 13 - 18 drivers. A huge range of activities are available at this circuit for stag groups or parties of all kinds that can be included into a go karting package. Ride on the rodeo bull, have a go at archery or laser clay shooting, enjoy a quad biking safari or have a go on the mini diggers. Contact us for more info. 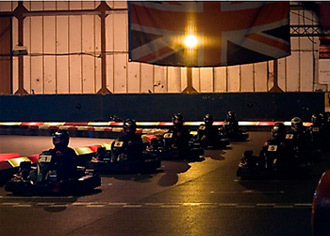 This venue has a great facilities for corporate events and team building exercises and has a wide variety of activities that can be included into a go karting package. You can have a go at archery, mini digger driving, quad biking and even ride a rodeo bull. Let us know how many people you expect and when you would prefer to attend and we will supply you with a selection of options and prices.